I also spent time going over the rules in detail and creating cheat sheets for us, so that we wouldn't have to look up those specific rules (like embarking, cover saves etc.) I paid particular attention to weapon effects (Rapid Fire, Assault, etc.) and a detailed break down of the turn order, which for an old 3rd ed/4th ed player helps me keep the rules straight - I get a little mixed up some times. I am really not sure why I never created rules cheat sheets before, and I highly recommend it to any new players, or players switching editions. It really got how 6th ed works into my head. Like last time we are using the only two armies we have: my old and repainted Death Guard force against Sarah's Space Wolves. Like last time Sarah was building her army using the 7th ed Codex, which I think is a better match for my 6th ed Chaos Space Marine Codex. Sarah took the week between our first and last battle to really re-think her forces. She combined her small 5 man Grey Hunter Squads into more powerful 7-10 man squads, added in a squad of long Fangs, and re-armed her Terminators with a better heavy weapon spread. She felt this would give her more power and the ranged damage she needed. I also heavily modified my force. 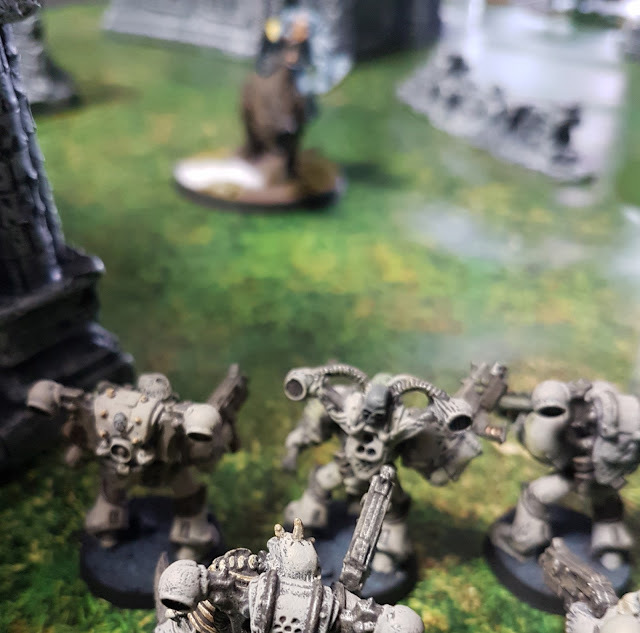 Last game I did not have the numbers to properly hold the line, so this time I increased the number of Chaos Space Marine Squads quite dramatically. This meant that I also had to lighten my HQ and Elites choice in order accommodate these changes. But I thought the more units the better. 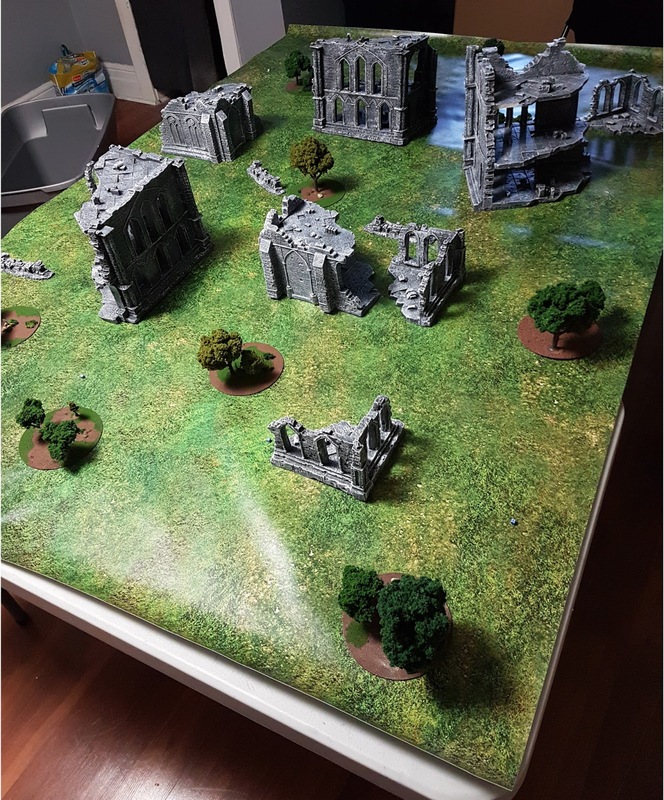 Like last time we created a ruined and overgrown city using our Urban Matz Ruined Gothic Buildings and our Game Matz 6ft x 4ft Grass Mat as well as my home made CD wilderness scatter terrain. 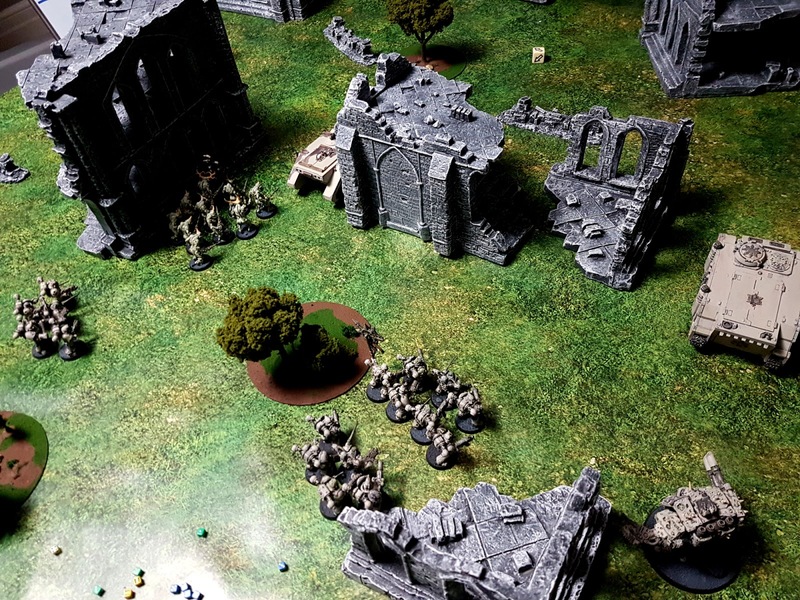 Evetually we hope to add in denser wilderness, with more scatter bases, standing stones using 3D printed models, and an Eldar Webgate - which is the objective these two forces are slowly working towards. Because we are just getting back into it (and soon to be leaving 6th Edition behind) we decided to keep it simple and a Purge the Alien Scenario is just that. Each Squad you destroy earns you a victory point. You get an extra victory point if you get the first kill, and HQ's are worth two victory points each. Unlike last time, this game's set up was a meticulous process. 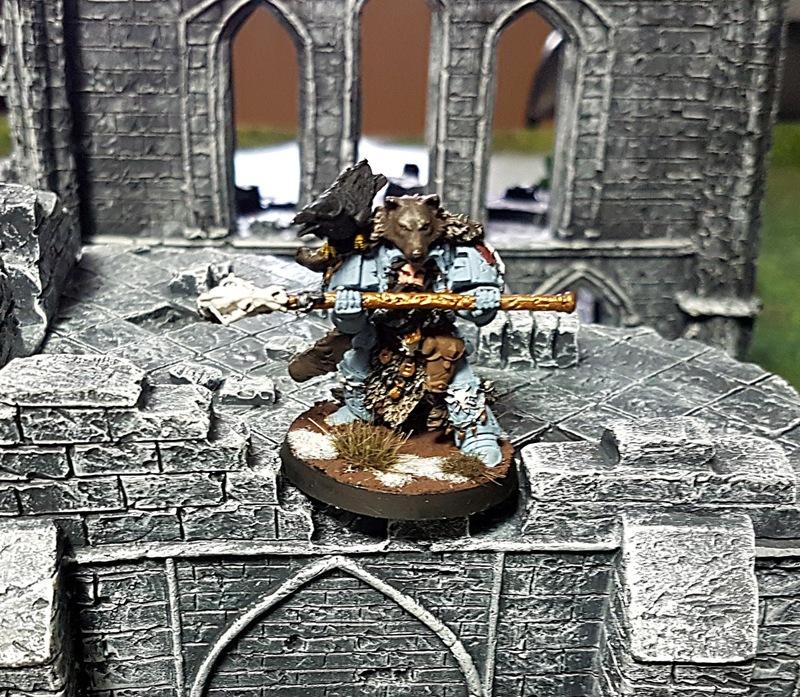 We both placed our armies, and during our first turn (Space Wolves went first), we were both on track to get into position. 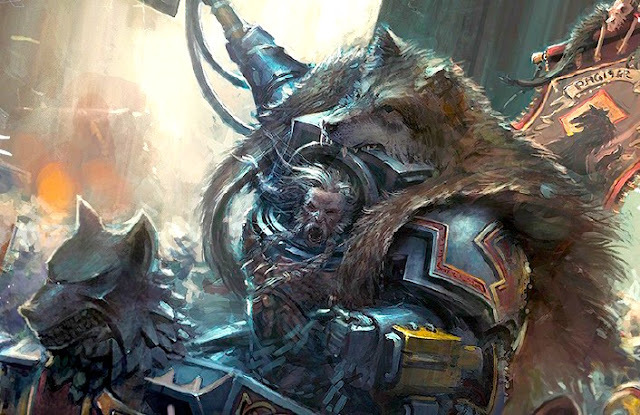 Sarah, commanding her Space Wolves was moving her army along three fronts. She had a left and right flank, as well as a middle section: all well supported and given enough space to maneuver. 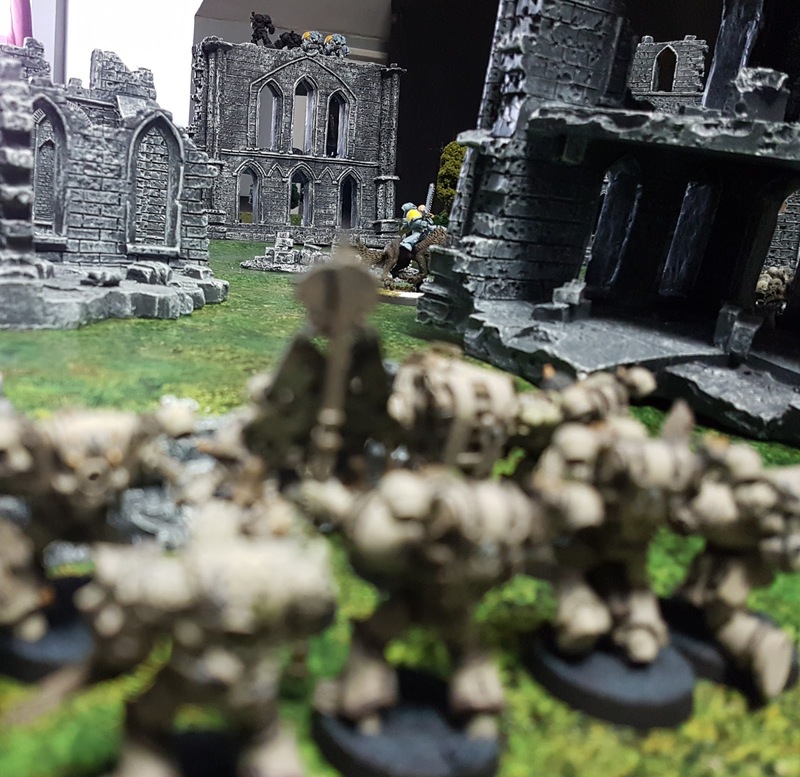 My Death Guard were ready to create a ring of fire around the center of the table. Using tightly knit groups of Marines to encircle this area, trapping Sarah as her largely close combat based army charged. On turn two, Sarah's Wolf Guard Terminators Deep Striked on to the field. They scattered quite a bit from their intended location, ending up on top of one of the two story ruined buildings. 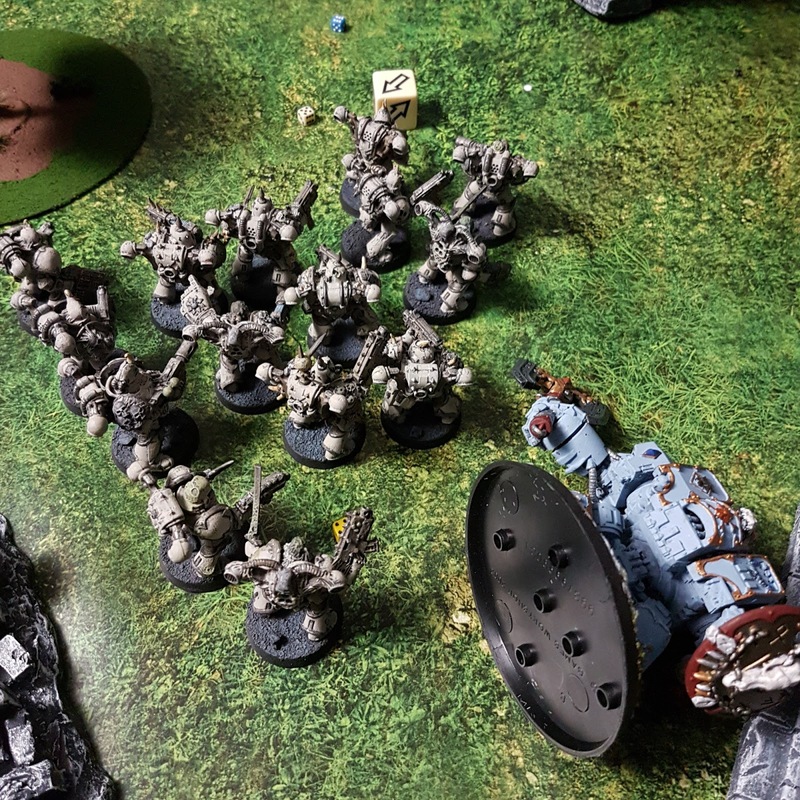 At first Sarah was disheartened, thinking ths squad was wasted, but during their shooting phase their Assault Cannons ripped through one of my Rhinos, causing it to explode with a 7 man squad inside! 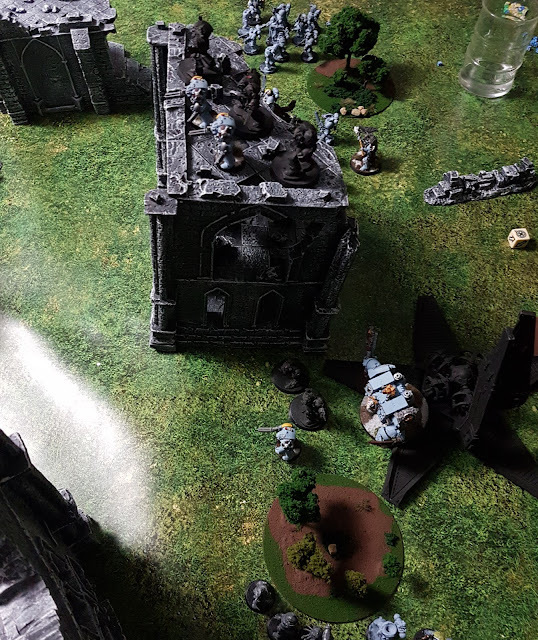 I thankfully didn't lose anything aside from the Rhino in the explosion, but I still needed at least one more turn to get my army into position and return fire. This turn my army would be completely in position. Sarah hadn't been able to close the distance between us fast enough, and I would really get a chance to open up the guns at her charging army. Sarah prepared for this keeping her distance to limit my fire power as best she could, and weakening my strikes with some heavy weapons fire of her own. But I still had dozens of shots to take. And so when it became my turn, I unleashed hell! Or at least I intended to. Out of all the Bolters, Plasma Guns, Melta Guns, Heavy Bolters and Missile Launchers I fired... I failed to score a single wound. This was my chance, and the dice failed me. Without trying to being too dramatic, in all of my years of gaming, I do not recall a worse series of rolls than I had that turn. With my "army weakening" volley's ending in failure, Sarah was free to charge into the field. However, she wasn't quite close enough to guarantee she would lock me in close combat. So fearing a more successful second round of fire she held her force back, only charging in with her Thunderwolves. and continued to pound my positions with Heavy Weapons. During her Thunderwolf Charge, my guns were able to cut them down during Overwatch before they ever reached the squad. 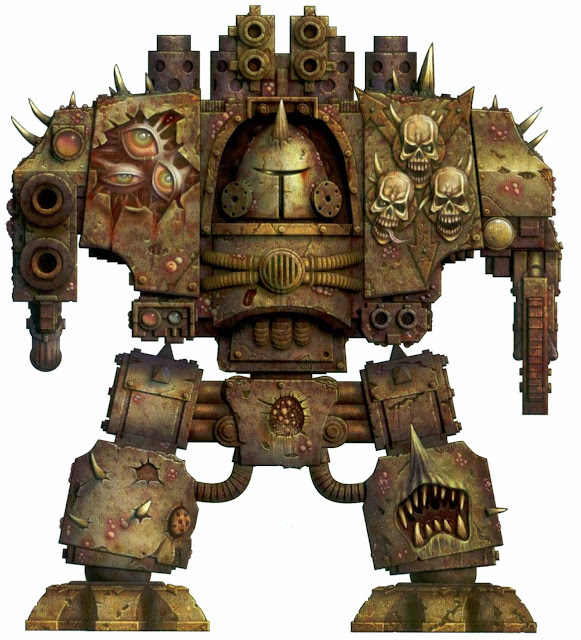 On my right flank she had also charged my Plague Marines with her Venerable Dreadnought. Luckily I had a Power Fist in that Squad, and was holding my own. Slowly I was clawing back some ground, but was it too little too late? We continued pot shots at each other trying to do as much damage as we could. Sarah managed to take out my Plague Lord, who had an unfortunate Deep Strike scatter roll sending him headlong into enemy territory. He put up a good fight, but in the end he was overwhelmed... and again I rolled terribly for him! I did manage to take down the Dreadnought. But it wasn't enough. I simply could not make up the victory points. Turn 6: Njal The Victorious! Or last round was an uneventful shooting match that neither side benefited from. Sarah didn't risk taking on my tougher units in a charge and pulled them back out of the range of any retailiatory charge I could make. The game came to a close on Turn 6, and I had lost it. 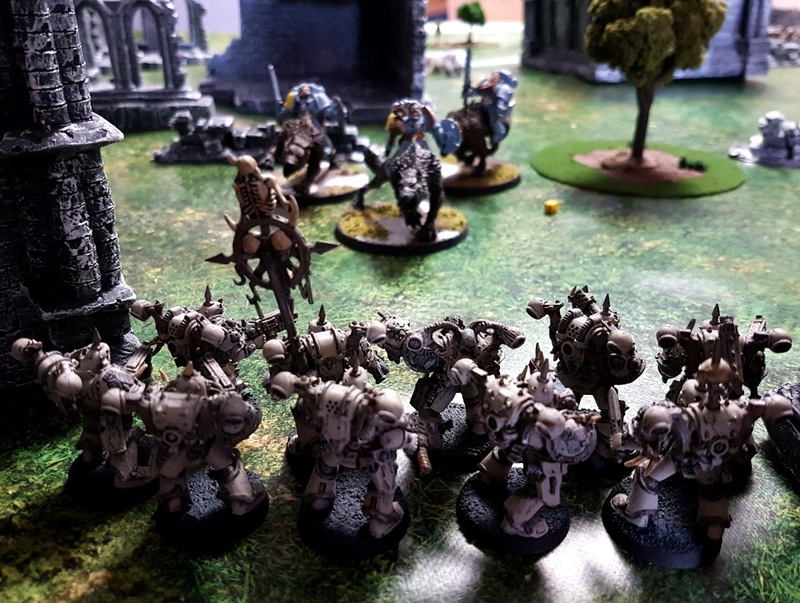 The final score was Death Guard 3vp, Space Wolves 7vp. This was an incredible game, with a lot of back forth and a lot of tactics. We both clearly learned form our mistakes! Sarah had a fantastic game. She went for the right units and concentrated her fire to guarantee those hits. Sure, my bad rolls helped that a little bit, but you don't automatically win a game because your opponent rolls poorly. You still have to wield your army effectively and seize the advantages. So that victory was all Sarah's! If I were to redo this, I would include more plasma and less melta in my army, but I honestly wouldn't do anything that differently. While Sarah seized the day, my dice rolls meant my strategies regularly failed to reap an benefits. I also probably should have been a little more aggressive in my advances, pining her smaller units. 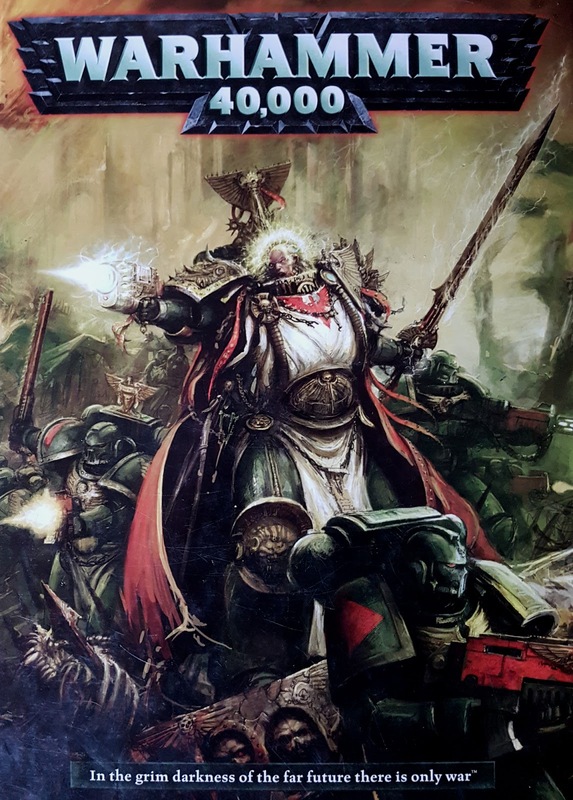 Regardless, I will have to reconsider my army and opinions yet again as Sarah and I have agreed this is the last game we are going to play in 6th edition (for a while - we'll be back). Our 8th Edition Rules just arrived this week, and we are anxious to give them a try. So come back soon for our next battle report covering 8th edition.